District and a former PUSD security guard who she alleges sexually abused her when she was a student at Marshall Fundamental High School. The 19-year-old plaintiff, identified in the Los Angeles Superior Court complaint filed Monday as Jane Doe, alleges sexual abuse of a minor, negligence and breach of a district’s mandatory duty to supervise and protect students. District spokesman Adam Wolfson said he was unaware of the complaint and had no immediate comment. According to the suit, the plaintiff was 16 when she was in the 11th grade at Marshall Fundamental High during the 2010-11 school year. The guard, Shawn Johnson, was 30 and “developed a friendly relationship with plaintiff at school and eventually obtained (her) cell phone number ...,” the suit states. Johnson sent the girl text messages that were “flirtatious and sexual in nature during school hours while he was working,” the suit states. In early March 2011, Johnson picked up the girl and drove her to an isolated location where he “manipulated, sexually assaulted and sexually abused her,” the suit states. Instead of protecting the plaintiff, Johnson “took advantage of the minor,” according to the complaint. The guard groomed the girl with his frequent text messages along with his “inappropriate touching (of) her on the campus,” according to the complaint. Johnson later admitted to his employer that he had engaged in misconduct with the girl and resigned, according to the lawsuit. 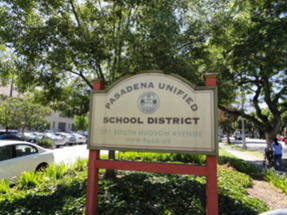 The complaint alleges that the PUSD negligently hired, supervised and retained Johnson. The girl confided in her father in March 2011, but did not do so earlier because of alleged threats of retaliation by Johnson, the suit states.